Glass shelves are used for a wide variety of applications for shops and homes. While they provide the same function of any other type of shelf they offer a modern and sleek look for many situations. One of the most popular uses of glass shelving is for bars. Whether it’s a commercial bar in a hotel or restaurant or in a home glass shelves for bars add both function and visual appeal. Glass shelves can be used in bathrooms to store items, which don’t look out of place when on display. Attractive bottles of perfume and other decorative items can placed on glass shelving and can create a feature in any bathroom. Every shower needs a shelf, and glass shelves for showers are easier to clean and look great. They offer a handy spot for shampoo, soaps and other essentials used in the shower. Corner shelves are the most popular of any glass shower shelf. Cabinets, displays and alcoves are the perfect place for glass shelves. Glass shelves provide a strong and durable surface, which offers a more attractive alternative to timber or melamine. 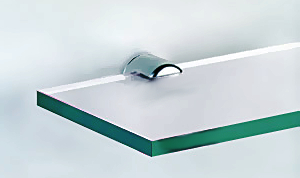 Floating glass shelves are also possible in some circumstances. Extra thick glass shelves can be manufactured for heavier items such as Foxtel units, DVD players, game consoles and other electrical components. Toughened glass shelves can also be used for this purpose to prevent breakage due to excessive heat. For glass shelves in Sydney call your local Valiant office.